There are only a few places in the angling world that are famous for “Grand Slams”. This special designation is usually bestowed upon a lucky angler who can catch three different species all in one day of fishing. 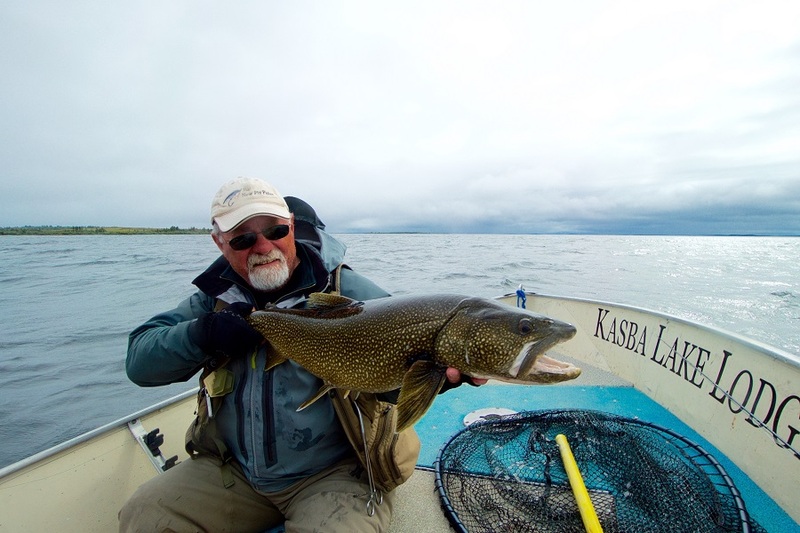 At Kasba Lake Lodge in Nunavut, achieving the “Grand Slam” of catching a lake trout, northern pike and Arctic grayling all in one day is actually not all that special. That’s because Kasba Lake and its surrounding watershed are blessed with a multitude of fly fishing opportunities. Even better than achieving the “Grand Slam” is the fact you’re usually catching trophy-sized fish! TNFF host, Bill Spicer, spent a week at Kasba Lake Lodge shooting an episode of The New Fly Fisher. Based on his experience, here’s an overview of the three species available at Kasba Lake with information on how to achieve the ultimate Nunavut “Grand Slam”! 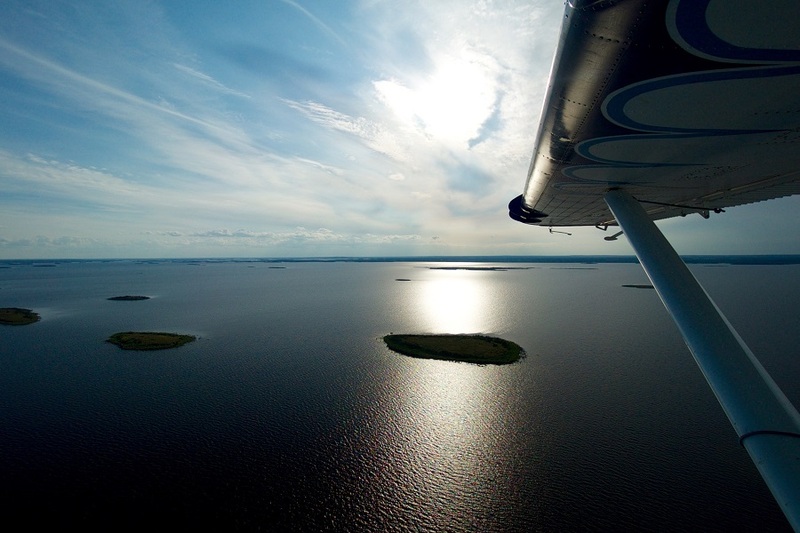 The Kasba Lake watershed is a highly productive fresh water ecosystem filled with millions of whitefish, cisco, fresh water shrimp and small aquatics, all important food sources needed to grow lake trout. Thanks to this tremendous food base coupled with their strict catch-and-release policy, the lake trout here are plentiful and large. For fly fishers there is ample opportunity of taking trophies on the fly as the cold water conditions hold them high in the water column. In June and early July lake trout will eagerly take dry flies under calm conditions. During the cisco spawn from late July through August, fly fishers can experience outstanding top-water action as lake trout forage on these baitfish in shallow waters right on the surface. Bill Spicer could not believe how aggressive these fish were as they continually slammed his topwater tarpon poppers! His biggest lake trout of the week was over 17 pounds and on a dry fly! For these monsters we recommend 8 or 9 weight fly rods with fast-action tapers to help cast large flies and also fight them quickly to the net. You’ll need floating lines and at least one sink-tip or full-sinking line, preferably in a 3-6 inch per second sink rate. These lines will help you get streamers down in the water column if wind conditions prevent you from using topwater flies. Recommended flies include: Game-Changers in white, Clouser Minnows in red/white or chartreuse/yellow, tarpon poppers in white or red/white. Umpqua’s “Pole Dancer” fly has also worked very well when lake trout are in a feeding frenzy chasing cisco. Kasba Lake’s remote fishery possesses over 2,000 miles of shoreline, hundreds of islands and reefs, and numerous rivers and streams providing shelter, forage and ambush locations for large northern pike. Like the lake trout here, the northern pike grow quite large thanks to the incredibly rich diversity of baitfish available. In 1975, Kasba Lake Lodge was the first fishing lodge in Northern Canada to implement a strict catch-and-release fishing policy to prevent overstressing the fishery. That is why there are so many giant specimens to catch here. Fly fishers can experience exceptional shallow water casting for big pike, including topwater action. Casting tarpon poppers or even large deerhair mice will result in explosive surface takes by giant pike in waters from 3 to 6 feet in depth. Thanks to the mainly cold-water conditions, the big pike generally stay shallow for most of the fishing season. Early season is exceptional for hunting massive post-spawn fish that are very aggressive. Bill found using a 9 or 10 weight rod was needed to cast large wind-resistant flies as well as to fight these hardy pike. Pike here really fight well due to the cold water conditions. 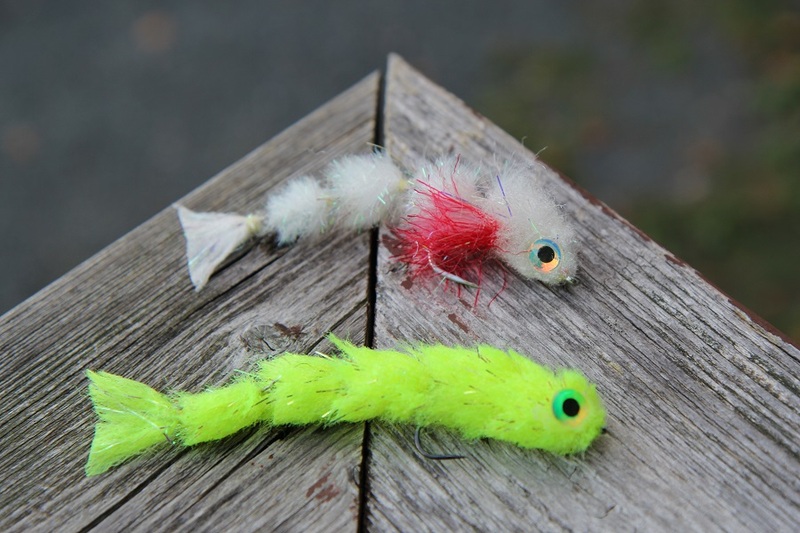 You need strong mono leaders of 6-8 feet in length of 40-50lb test to which you should attach a 40lb wire bite tippet. For flies, tarpon poppers in black, chartreuse and especially orange/black worked well. 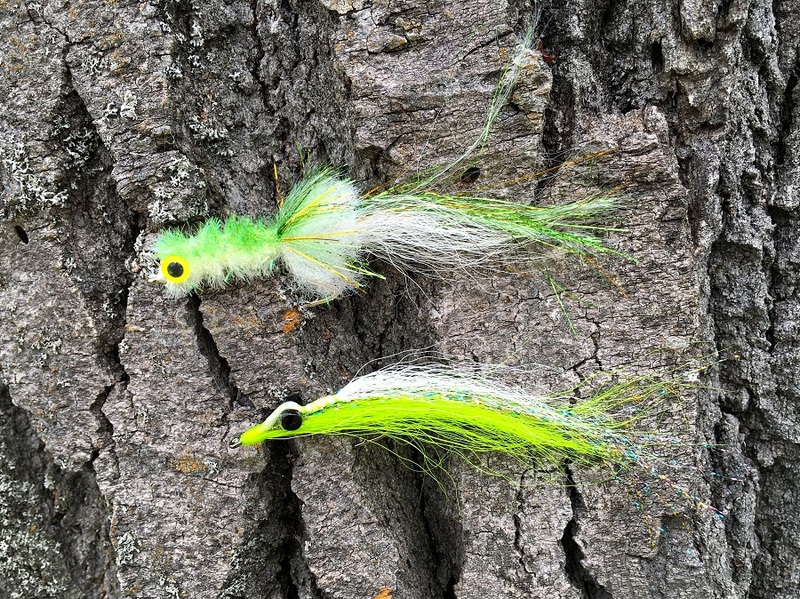 Virtually any large streamer with 1/0 to 3/0 hooks will trigger strikes, but one of our as was the Murdich Minnow in white, black/orange and of course green/white. Seeing your topwater fly disappear in the mouth of a 40 inch plus pike will truly make your trip here all that more memorable! 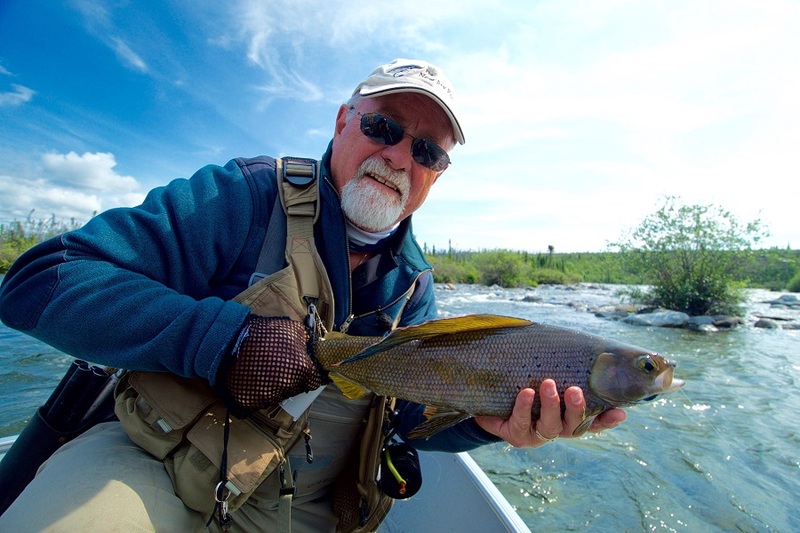 For dry fly junkies Kasba Lake and the surrounding rivers are truly special because of the large quantities of Arctic grayling that are available. The rich biomass of aquatic insects in this watershed help the them grow to epic sizes. Specimens of 3-4 pounds are fairly common, with the lodge record standing at 5lbs 10 oz. These wonderful and beautiful fish will readily come to eat your dry fly offerings with gusto, often jumping clear out of the water to attack. If the fish are not taking on top, then they will take swung wet flies and nymphs on sink tips or sinking lines throughout the season. However, if you love dry fly action, then consider a fly fishing trip from mid-July through mid-August. These are prime dry fly months and coincide with both lake trout and northern pike topwater opportunities. A 4 or 5 weight rod is all you need for grayling with a simple click-pawl reel. Medium to soft action rods will really help you enjoy the fight of these spectacular fish. Bill found that dry flies such as Goddard Caddis, Adams Parachute and Humphy flies in yellow worked well. 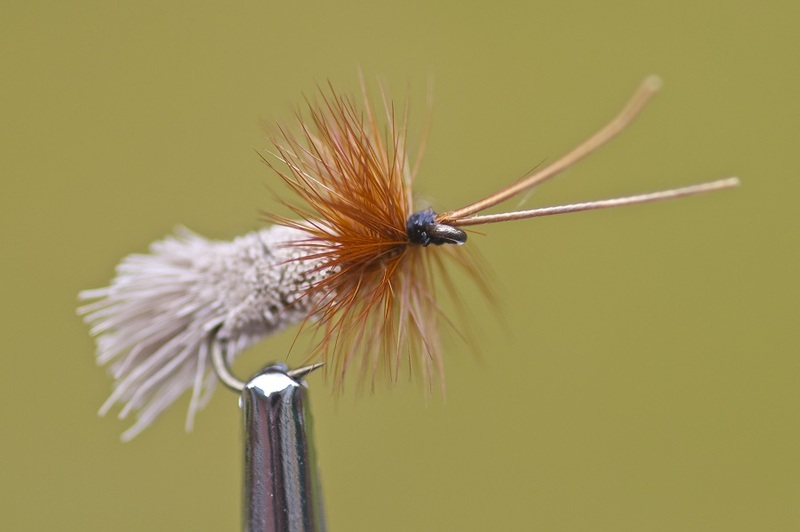 For wet flies and nymphs, Zug Bugs, Hare’s Ear and Royal Coachmen are all effective patterns. One of those very special places all anglers dream of visiting. Located in the wilds of the far Canadian north, this epic landscape and over 2,000 miles of rugged shoreline will thrill you beyond words. And then there is the fishing. As Bill Spicer wrote “It was nothing short of incredible!! It didn’t seem to make a difference if the weather was bad or good, the fish were always biting.” There are not many places that can boast that type of fishing. 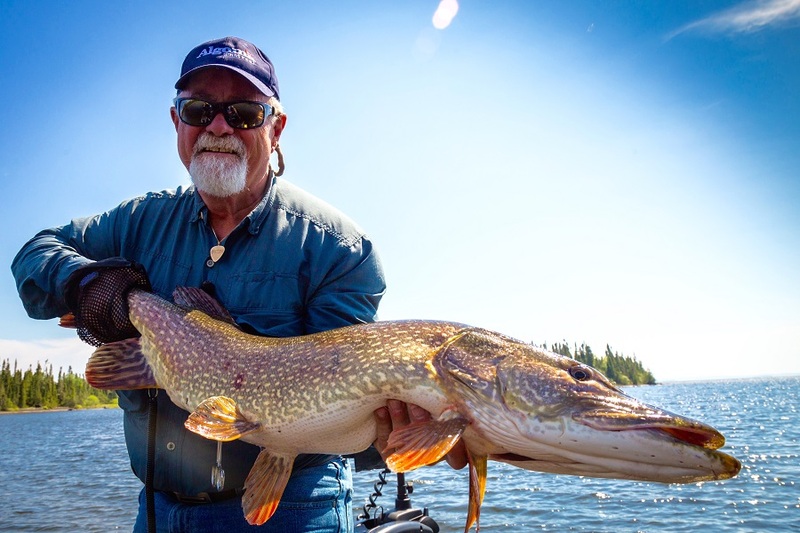 Bill was able to experience the “Grand Slam” of the north, catching numerous pike over 40 inches, grayling to 4 pounds and lake trout to 17 pounds – all caught on topwater flies. If you are planning a fishing trip to Kasba Lake, you’ll see why it’s regarded as one of the best fishing destinations in Canada and the true home of the northern “Grand Slam”.